I recently ran into an interesting situation where my Veeam Backup for Microsoft Office 365 stopped working. As a bit of background, I had recently moved the software to a new server. A bit of tangent, but one of the things I love about Veeam’s Office 365 backup is how small it is. The download is less than 12 MB! That makes setup quick and easy. Back to the problem … There wasn’t anything that immediately stood out. The job wasn’t running based on its schedule, nor could I start it manually. Something was definitely up. My first clue came when I looked at the job screen. I noticed under the Details column that the “Proxy is not available“. Very odd, especially so considering the proxy was on the same host as the software. With version 1.5, there is the ability to add additional proxies, but I wasn’t using it in this case. I hopped on over to the Backup Infrastructure –> Backup Proxies and ran a Rescan. No dice. Doing this didn’t result in any errors, but it also seemed to run too quickly to actually be doing anything. Next up I tried the Backup Repository. Trying to obtain the Free Space on the repository threw an error. Very odd. It was at this point that I started reflecting back on any changes that may have been made that could have caused this. That’s when it hit me: as mentioned above, this was a new install on a newly deployed template. In my haste, I had installed Veeam for O365 prior to renaming the server. 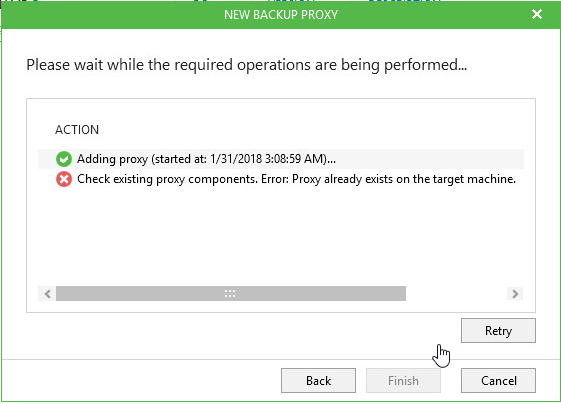 When I installed Veeam for O365, it deployed a proxy and repository using the server’s old name (in this case WIN-9N3VTFN4V4). Because I had changed the computer name, Veeam wasn’t able to connect to these components. I first tried to delete the proxy, however, that wasn’t an option. If you take a look at the screenshot to the right, you’ll see that the only option is Rescan, which didn’t really do anything. Next up I tried adding a new proxy. This is where it gets especially kludgey. I opted to use localhost for the host name. I then received errors that the proxy was already installed. Specifically, I received: Check existing proxy components. Error: Proxy already exists on target machine. Just for the heck of it, I tried a different port number as well, but still no luck. Next up, I tried to trick the machine into believing it was still the old computer. I did this by adding an entry for the old computer name under the hosts file (C:\Windows\System32\Drives\Etc\Hosts). Surprisingly enough this didn’t resolve the issue. Next up, an uninstall and reinstall. I wasn’t entirely convinced this would resolve the issue, and I was right. Right after reinstalling, the original settings were still in there. That told me that the configuration must have been stored somewhere. I started hunting and quickly wound up in the c:\programdata\Veeam folder and found a Backup365 folder. I uninstalled the software again, renamed this folder to Backup365.old, and reinstalled, and bingo! This time around I was able to add the components in without issue. Although it isn’t really an ideal solution, at least the install is super quick. I have a thread open over at the Veeam Community Forums, so we’ll see if this ends up getting a fix at some point. Hopefully, this will help anyone else who might fall into the same trap I did. Pingback:Veeam Vault #10: Latest Veeam Releases and Vanguard 2018 Update - VIRTUALIZATION IS LIFE! Thank you. I rename computer name after install Veeam and face this problem like you. Thank you for point out about renaming Backup folder. Stop console and the Veeam services, delete ConfigDB and ProxyDB directories (default in C:\ProgramData\Veeam\Backup365) and restart the services. Now you have a new configuration with an up-to-date proxy name when you start the console. The jobs and history are gone. The repositories stay intact. You can re-create the job(s) and point to the repository.